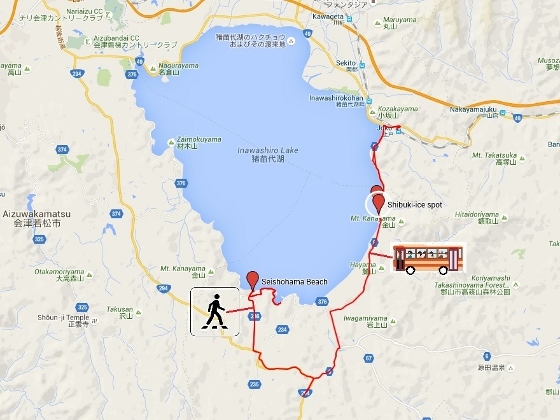 Today I visited Konanmachi District, Koriyama City, which covers southeastern shore of Lake Inawashiro. 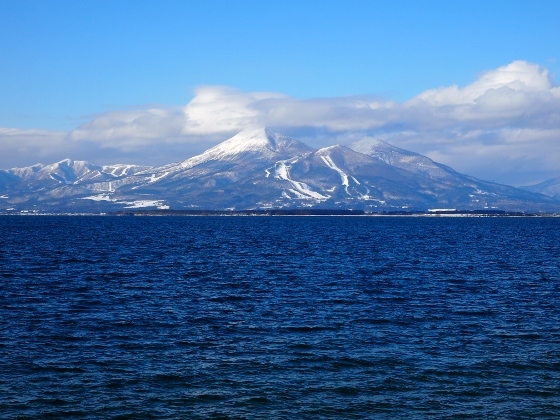 At Seishohama Beach in the southern shore of the lake, I could see beautiful scenery with snow and many swans with the background of the lake and the mountains. 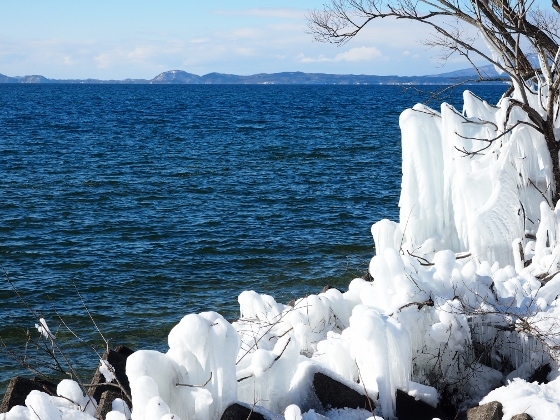 On the eastern shore south of Jokohama Beach, great Shibuki-ice stood along the shoreline in winter sunshine. I went to the sites by train, bus, walking and on a local citizen's car. 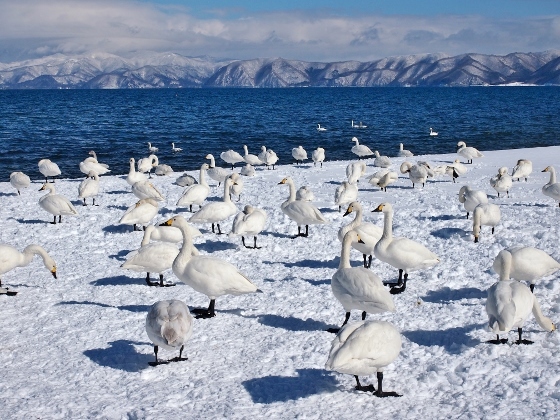 On the snow covered Seishohama Beach, swans as many as hundred were resting or swimming as shown above. It was an unearthly beautiful world. On the eastern shore, along the Prefectural Route 9, there is a place where large and white Shibuki-ice develops on trees and rocks as shown above. They are created by splashes of icy lake water blown onto trees and rocks in frigid winter period. Local people of Konanmachi are kind. When I was waiting for a bus which was two hours ahead, a woman asked me "Where are you going? Why don't you ride my car?" I was very lucky that I saved two hours to go to Shibuki-ice site. Today, it was a rare sunny day in snowy mid-winter season around here. Even Mt. Bandai appeared in a blue sky with less cloud as shown above.